I regret to announce that I have begun the process of taking down The Garret's Facebook page. Facebook's last update broke it so that it was showing everything but The Garret. After two weeks and repeated complaints, they have failed to fix it or, as far as I can tell, do anything about it. The process of removing the page from Facebook takes two weeks. If I decide to reinstate the page after that, I'll announce it here. So glad I found you. I was a regular, guitar in hand, at the fireplace, just about every weekend in the 1962 - 1965 time frame. My brother went on to be a professional jazz guitarist, playing with Gerald Wilson's Big Band, Barry Manilow and many others. I am still stuck with my simple blues riffs and the same Goya acoustic guitar, today principally playing for my nine-year-old granddaughter as she improvises in song. When I was the feature editor of the Daily Trojan (USC) in the 60s, I frequented the Garret and was a big fan of Terrea. We went there often. Nostalgia!! Originally from venice beach area now in Oregon, in the 60's I used to frequent the garret, ahsgrove, troubador, pandoras box, et al. That was a time! Carry on. RIP Terrea and Pete Seeger. I was listening to old folk music on public television and for some reason I typed Terrea's name in Google and came to this site.1964-65: I was still in high school and we were in Girl Scouts, crazy with love, hormones and obsessed with folk music. the Girl Scout Council explicitly barred us from going to the Garrett but that didnt stop us. we would tell our parents we were going to the movies on a Friday night hop in the car in the San Fernando Valley and get over to the Garrett soon as we could I still remember mint hot chocolate with whipped cream, the crowds jammed in around tiny tables and Terrea's singing. She lifted and broke our young hearts. It was a place of safety where we could figure out who we were, amidst the excitement of just being there. I know that Garrett was many things to many people but for us it was a place where we could go and be ourselves and be among people like ourselves both folk musicians and people who were trying to understand their own identity. After high school we went our separate ways but Terrea, BJ and this wonderful space were.really important to us at a pivotal time. anyway this was really fun to look through and maybe my little anecdote will add something more to the story. Up for sale is the MEGA RARE smooth folk-psych SELF TITLED LP by Renowned artist Terrea Lea. The front cover is personally autographed by Terrea Lea. The lp is on LRM Media productions LRMSLP1 STEREO. Terrea's band includes Carson Smith on bass. The producer of this LP is Alan Weiss. Assistand producer is Tish Musten. This news saddens me. I would have gone to the memorial had I know. I would like to get my hands on any DVD or download of Terrea singing "Oh The Apple Tree." This news saddens me. Such memories. I wish I could have gone to the memorial service but I didn't know. I would like to get my hands on a dvd of her singing "But Oh The Apple Tree." I would appreciate any help you can be. I am on my own too now - My wife of 30 years divorced me and I am back in Santa Monica, CA. I've told this story before but here is the short version. Terrea & B.J. took me in & gave me a key, blanket & pillow and told me to stay as long as I needed. The last few years I'd been calling Terrea about once a month, I miss those calls & her but as long as we play her music she is still with us. In Jesus language the word for Death is "Muta" & means, not here present elsewhere. just doing some memory searching. times enjoyed at the Garret and Terrea's sweet hospitality. A memorial page has been added for Terrea on the main menu at left. It includes links to her obituary guest book page at the San Diego Union-Tribune. Friends are encouraged to visit and leave comments. I regret to report that, on Janury 5, 2013, Terrea Lea passed away quietly in her sleep. That is all the information I have at this time. Friend of Joan Baker's. Washed dishes in the weekends for a season probably '64-'65 ish. Notably fell asleep on the floor with my eyes open and scared the #**# out of the waitstaff. My uncle, Michael Kollander worked with Terrea in Les's band, The Balladeers. I would appreciate contact from anyone who knew him during this period. Regular @ Garret - c. 1961 - 1963. Will try to check back in later to supply more info. I have no idea where this is going but Diane Gerow-Corn is my lost cousin I think. Terrea, some friends and I were chatting online about our days breaking into the music biz, in Hollywood in the 60s, and of course your name came up. You were so good to so many of us. So I did some googling around and found this site. Whoops. I just noticed the post about Terrea's "condition" from 5 years ago. I hope this love note isn't past due. Now I have to look around and see what's up. But this is a love note. 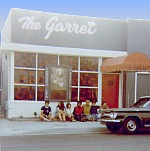 The encouragement I got at the Garret in the mid 60s led me to a life in music that I love.